After spending more than 36 hours in the hands of unidentified gunmen, the 20 University of Buea Football boys were on March 21, released by their captors. 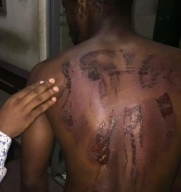 The boys who were severely tortured by their abductors sustained wounds on their backs. The boys were taken from University of Buea’s Pitch B, also commonly known as Wembley, as they trained during their morning session of the block training in preparation for the University games billed for Dschang. The players, who fell into the dragnets of the armed men, were those who arrived early for the training session of the day. Atlantic Chronicles gathered that the team’s coach, Nicolas Asongu was absent during the Wednesday morning training session due to an accident on Tuesday evening at Malingo, a neighbourhood in Buea. He is said to have been with the accident victim in hospital. The players were released some minutes after 8 pm, on Thursday, March 21, with the assistance of the Southwest branch of the National Commission for Human Rights and Freedoms. The Vice-Chancellor of the University of Buea, Prof Horace Ngomo Manga visited his released students at the hospital to sympathise and encourage them. He urged them to gather momentum and overcome their traumatic experience, in order to join their mates in school. The next time I read a blog, Hopefully it won’t fail me as much as this particular one. I mean, I know it was my choice to read, but I really believed you’d have something interesting to talk about. All I hear is a bunch of whining about something that you can fix if you were not too busy seeking attention. I simply want to say I’m new to blogs and truly savored you’re web page. Most likely I’m want to bookmark your site . You surely have very good posts. Bless you for sharing your website page. Where online can an accredited psyciatrist message write-ups (or blog sites) for them to become popular?